The Ashton VSG Wizard cigar. For those who desire a powerful and intoxicating flavor with a complex rich finish, look no further than the Ashton VSG. Demanded by many and enjoyed by only a few due to its limited availability, the Ashton VSG is a connoisseur’s cigar. 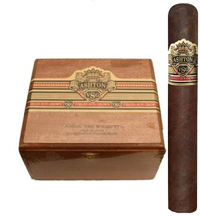 The VSG is blended exclusively for Ashton by Carlos Fuente Jr. using 4 to 5 year aged Dominican tobacco. The distinct flavor of the VSG comes from its wrapper grown on a private estate in Ecuador owned by the Oliva family. This wrapper leaf is grown for the Fuente Family exclusively for the Ashton VSG. Extra aging and fermentation allows for a rich and full flavor with a strong body, while maintaining an incredibly smooth character. The Ashton VSG is consistently rated incredibly high by industry publications and continues to be among the 10 most rare, sought-after cigars in the world. Get your Ashton VSG now!